With this book, Valorie is on to something. She takes 28 principles and make them very clear with good examples and plain language. Even if you have it all together, I still believe that there is something that you can learn from this book. "Knowing that God is with you is a key to authentic confidence. So authentic confidence is self-confidence plus faith." "Authentic confidence is comfortable with a lack of information right now because you know that you can find the information." "Talent and education alone are not enough to maximize your potential. 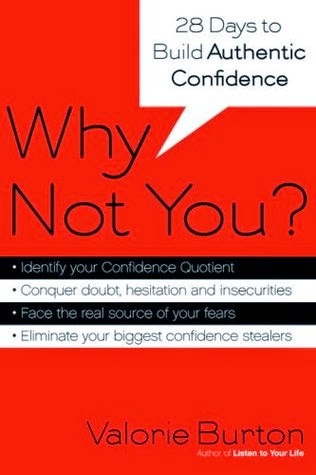 You need authentic confidence to realize your full potential." "Feelings are honest, but they are not necessary the truth." "My passion may bore you to tears and vice versa, but that's what makes each of our passions so unique." "Whether or not someone else is to blame for our circumstances, we don't move closer to our goals by blaming and complaining." "Be confident in God's timing." There is so many other things that I took away from this book, but there is no point in me rewriting this book when you can read it for yourself. This is a great book to use to do some self-reflection.